Cracks on the dormant volcano of Mount Elgon in eastern Uganda continue to widen in the wake of last month’s landslides, sparking fears a similar tragedy may be imminent. But the land slated for relocation might be equally at risk, leaving survivors with distressing choices. At least 46 people were killed and more than 850 displaced when floodwaters triggered by a landslide washed away much of the town of Bukalasi and surrounding villages in the district of Bududa on 11 October. Exacerbated by climate change, deforestation, a growing population living off the land, and years of government inaction, such disasters have become increasingly common in mountainous eastern Uganda. In March 2010, over 350 people died in landslides, followed by similar disasters in 2011 and 2012. For those around Bukalasi whose lives have been upended, and for tens of thousands of residents considered at risk of future landslides, there is no easy solution: home has become hazardous, but the land the government has earmarked for relocation is shrouded in warnings and controversy. Esther Nambuba’s house, bar, and restaurant were completely destroyed when heavy rains caused the Tsume River to burst its banks, sending water and boulders rushing towards her village of Naposhi. Last month President Yoweri Museveni apologised for not having relocated people since previous landslide disasters, blaming local politicians and vowing to make sure they acted quickly this time around. An official statement said at-risk communities would “immediately” begin moving to a new 2,868-acre plot marked out for them 60 kilometres to the north, in the neighbouring district of Bulambuli. However, some local leaders have condemned the new site, saying much of it lies in wetlands that are prone to flooding and is just as risky as the land people are on now. Efforts to relocate people have in the past also been frustrated by local politicians wanting to keep voters in their districts and by those who would rather stay near their fertile land on the slopes of the mountain. Ecweru insisted the risk of flooding at Bulambuli is a temporary problem that can and will be fixed. But there is also a dispute about who owns the land there and local political leaders, like Nambeshe, are calling for relocation to approved centres within Bududa district instead. The villages of Naposhi, Wanjenuwa, and Shilos were all busy trading hubs on the Tsume River before the disaster. They are now covered with heaps of soil and huge boulders that tumbled down the mountain. Residents counted many losses, including 144 houses washed away and many businesses destroyed. Bids to move vulnerable people have faced fierce resistance in the past. In 2010, the government resettled hundreds of Bududa landslide survivors to the district of Kiryandongo, about 400 kilometres away. But many returned, citing ancestral links and the need for more fertile soil. Uganda has one of the highest population growth rates in the world, with an average fertility rate of 5.4 children. As more people settle on the mountain, more trees are felled to make way for homes and agriculture, making mudslides and flooding more common. At least 67 landslides were recorded following heavy rains between May and October in the Mount Elgon region, according to the government. Climate change may be causing more flooding generally, but Mary Goretti Kitutu, a former environmentalist who is now Uganda’s state minister for environment, said the “main driver” of landslide risk in the region is a growing population dependent on agriculture. The Uganda Red Cross Society has launched an emergency appeal to support the Bududa victims with services, including temporary shelters and medical assistance, and to help train disaster responders and volunteers to raise awareness about the effects of climate change. 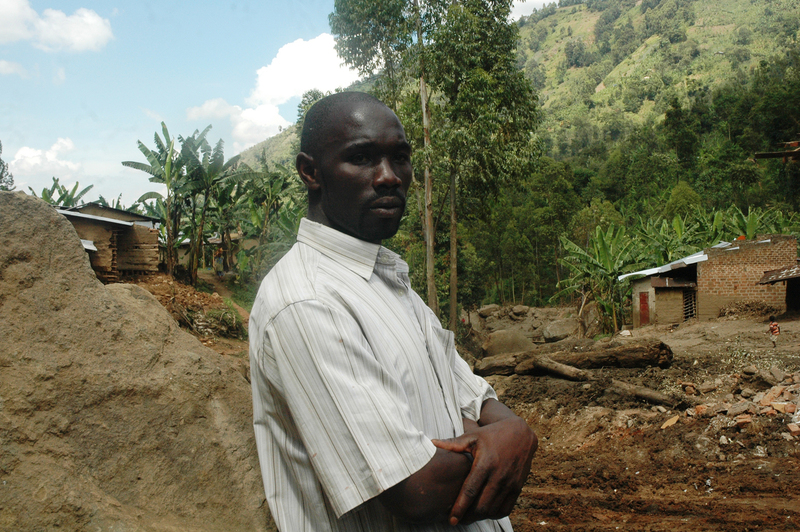 Martin Owor, Uganda’s commissioner for disaster preparedness and management, said the government had established strong links with local communities along the mountainside, distributing some 750 smart phones and 150 megaphones to community leaders so they can raise the alarm more quickly when they spot the first signs of future landslides. Under the government’s new resettlement plan, Ecweru said more than 900 households (or the 6,300 people considered most at risk) will immediately be relocated from Bududa to Bulambuli; each household will be given building materials to construct a two-bedroom house. From the next financial year, beginning in July 2019, the government will then relocate 10,000 people per year until it resettles the entire target population of 100,000. The resettlement process is expected to last 10 years. While staying puts their lives in danger, moving could pose even higher risks. “All persons at risk will be resettled, and the places they will have vacated will be planted with trees for environment protection and eco-tourism,” Ecweru said, referring to at-risk areas near Mount Elgon national park that are popular with tourists. But those living in the areas at risk of landslides remain concerned. While staying puts their lives in danger, moving could pose even higher risks. “I have a lot of fear and trauma to continue staying in this place,” said 34-year-old John Namutambo. “The government should expedite the process of relocation to Butembatye in Bulambuli. Even if they haven’t built for us, we shall start life in the tents. But others, like 40-year-old Fred Wesonga, who saw his house and business “washed away within minutes”, say they can’t take another risk and wonder why they can’t just be given money to purchase land somewhere they feel secure.